Welcome to our home! Beautifully renovated with many custom upgrades. Central Mt. Washington Resort location with complimentary shuttle service to all resort activities. Our private, fully equipped, luxurious, end-unit townhome has been tastefully updated with a custom gourmet kitchen and all new baths. This tastefully decorated home has a light and airy ambiance with cathedral ceilings in the living room, dining room and both upstairs bedrooms. All three bedrooms have private baths, and there is an open plan kitchen/family room where the chef can share in all the family fun. Enjoy a movie on cool nights by the wood burning fireplace. Later on, enjoy a soak in the whirlpool bath. Everything you need for a relaxing vacation is provided complete with a fully-equipped gourmet kitchen, and all linens for your convenience. Why stay with us? Exceptional personal service, location, comfort and ambiance. Welcome! Private, high-end luxury. Beautiful mountain views! Attentive customer service. Custom renovation, high-end appliances, granite counters, fully equipped for your dining needs. Our community boasts its own tennis court. Bring your own gear - complimentary to use. We offer our guests the complimentary Mt. Washington Resort shuttle, which will take you to all resort amenities including the ski lodges, golf course, spa, Mt. Washington Hotel, and on-property restaurants. Resort dining appeals to all levels from very casual to gourmet dinners at Bretton Arms and in the Omni Mt. Washington Hotel dining room. We stayed for two nights in this great condo. We were 4 adults and 4 kids which worked perfectly for the space. Each room having its own full bath was a great touch, but fair warning - the bathroom on the main floor also doubles and the only bathroom on the main floor - so it was a little awkward for the couple staying down there to keep toiletries, etc out. The kitchen is great and was well stocked with essentials! Only two minor complaints: 1) we couldn’t use the fireplace because the whole space would start to fill with smoke, even though the flume was wide open. 2) you have to take the garbage and recycling out yourself....and by “out” I mean put it in your car and drive it almost out of the resort. It’s not an ideal way to leave a ski vacation and the directions to the dumpsters were wrong so we ended up just taking the trash with us until we stopped for gas and threw it out there. Otherwise - place was great and the shuttle service is very convenient! We’re so glad you enjoyed staying in our home. Thank you for your comments, and apologize that you did have some inconveniences. Although the bunk room and the master bedroom do have private bathrooms, the third bedroom does have its own bathroom that also opens to the main floor through a separate door. Our understanding is that most guests just keep that bathroom locked to the main floor and use it exclusively as a private bathroom for the bedroom it is connected with. All guests then simply use the bathroom in the bedroom they are staying in. - It is important to start an updraft in any fireplace prior to lighting the logs. This can be done easily by holding lit paper up near the flue. Once the updraft is started, there should be no issues with smoke in the room. We will improve the instructions that currently sit on the mantle. - In accordance with the HOA policies, garbage must be specially handled on the property to keep bears and other animals away; that is why it must be moved to a different site. The trash receptacle is only a quarter-mile from the main road exit on your way out - on the resort property near the ski area. We will review the instructions and directions to this location. Guests are provided with our contact information, and we are always just a phone call away to help resolve any questions quickly. 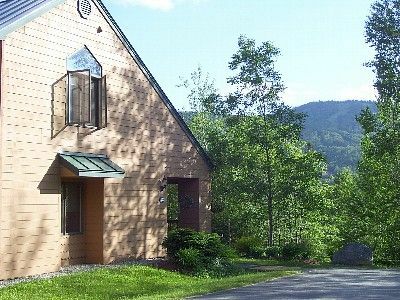 Very clean, well equipped & right in heart of Bretton Woods and all it has to offer. Thank you for your lovely comments! We look forward to having you as our guests again. Beautiful, clean and well equipped in a wonderful location with lots of amenities available! This property was the perfect place for a family weekend! Spacious and well kept condo well equipped with anything we needed. Shuttle amenity to the ski resort and hotel were extremely useful! Overall the perfect winter getaway, would definitely go back! It was a pleasure having you as our guests. We hope to see you again! Wonderfully clean, well stocked, warm, inviting townhouse. Close to everything we wanted to do. The kitchen was amazing - we ate all our meals there. The owners did an excellent job with providing pertinent information on how we could make the most of our stay. Well done! So very HAPPY! Thank you for your lovely comments. We're so glad you enjoyed your stay at our home and look forward to having you back! Come and see the multimillion dollar upgrades to our resort and restaurants. After a day of skiing, or hiking in summer, treat yourself to the latest in pampering at the luxurious spa at the Mt. Washington Hotel. Everything is here for family fun! Santa's Village, Storyland, and Clark's Trading Post are 20 minutes away for the kids. We are on the property of the grand Mt. Washington Resort Hotel, where numerous activities are available for kids of all ages. The Adventure Center at the resort offers many activities for adults and kids. For example; skiing, the indoor climbing wall, horseback riding, dog sledding, skating, sleigh rides and various other exciting activities for everyone. Summer activities include the longest zip line in the East, fishing, golf and tennis, kids' day camp, hiking and many other interesting adventures. All holidays are $400 - $550/night, with a three to four night minimum stay. Please inquire for more detail. Holidays include, but are not limited to: Christmas, New Year's, MLK, Jr. weekend, President's weekend, Easter, Memorial Day weekend, Independence Day, Labor Day weekend, Columbus Day weekend, Thanksgiving.